I have some silhoette's that I want to change to line art. I use these for patterns to cut timber on a scroll saw. Some are very small, and cutting to a thin line is easier than cutting to the edge of a black silhouette. I have attached an example that i want as a line outline not a solid black object. Also vector art would be the best so I can quickly resize as I need. Use Inkscape. It does vector graphics. There is a feature Path>Trace Bitmap. There is a bit of a learning curve to use it efficiently. Otherwise you can trace the image manually. Takes longer, but gives better results. Also a bit of a learning curve as you will need to learn to use Inkscape's paths. Cool I have Inkscape, never used it, but I will give it a go. 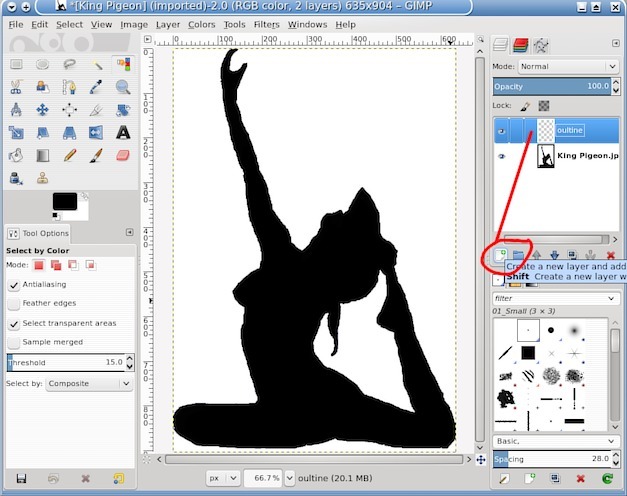 Inkscape will do the job, I am a big fan of Inkscape, but you also have to consider fit-for-purpose. Do you really need a vector? That is a fairly nasty image, lots of 'jaggies' around the silhouette. Does it matter in this case, no. 1. Add a new layer, always best to work on a new layer rather than altering the existing. 2. Back to the bottom layer and make a selection with the color select tool. In this case black or white, either will do. 3. 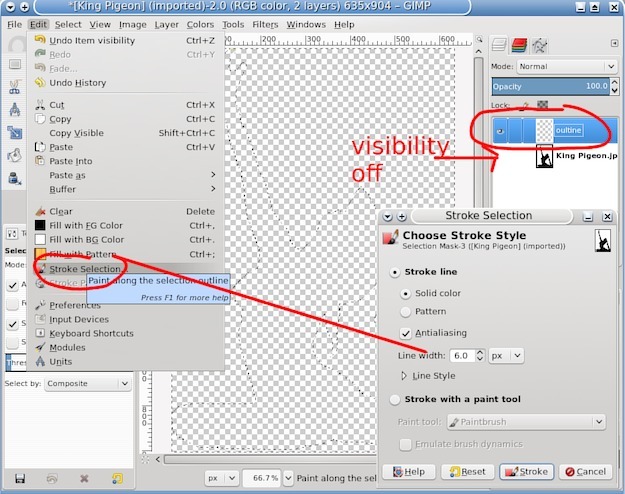 Turn off the bottom layer visibility, click that little eye. Back to top layer. Use Edit -> stroke selection. Set a line width and click the stroke button. Turn the selection off Select menu -> None. The line color comes from the foreground color so use anything except white. 4. You get an outline, do not worry about the checker board transparency, it does not print. If you need to keep everything, save as a Gimp xcf file. 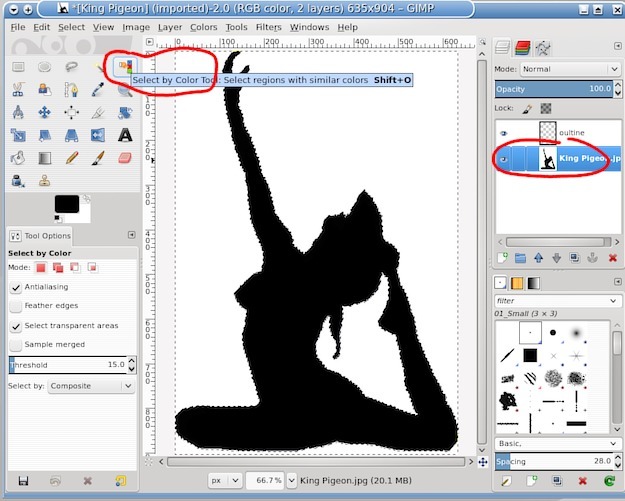 For a single layer export as a png or jpeg. Be careful you do not overwrite your existing file.